Kentwood Kids is proud to present their newest all-kids production of Lewis Carroll’s classic and loved story Alice in Wonderland. 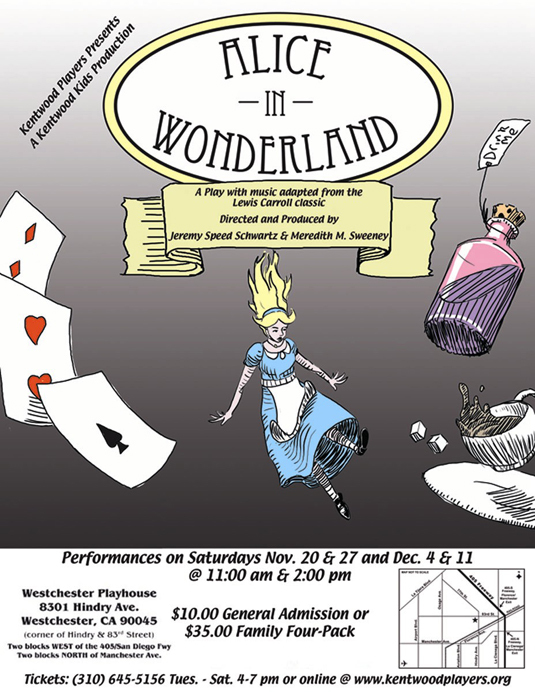 This two-act musical adaptation follows Alice as she journeys down the rabbit hole and encounters all the quirky, colorful and crazy residents of Wonderland, as well as a few surprises along the way! The cast features Valentina Povolo, Beatriz Valente & Rocio Vietina as Alice and includes Colette Araque, Melissa Cruz, Emma Erenmark, Fei Ewald, Han Ewald, Casey Gabriel, Logan Hannig, Katie Harfouch, Kalani Hildebrand, Osric Holt, Kobe Kubes, Caroline Macou, Margerite Nunez, Grace Rector, Claire Schaaf, Skylar Washington & Maddie Wilner. with the Mad Hatter (Emma Erenmark), the Dormouse (Han Ewald) and the March Hare (Maddie Wilner). “Oh my ears and whiskers, how late it's getting!” Alice (Rocio Vietina) follows the White Rabbit (Caroline Macou) down the rabbit hole and into Wonderland. Alice is in for a few surprises as she meets the quirky inhabitants of Wonderland. as the White Rabbit (Caroline Macou) helps prepare the game. “Curiouser and curiouser!” Alice is in for many surprises on her journey down the rabbit hole!